Today is our last day along the Texas Gulf Coast. We’ll be working our way back to Phoenix Sunday morning, and although we did contemplate extending our stay, the pull of appointments, seeing our children, and the anticipation of the desert blooming can’t be ignored. 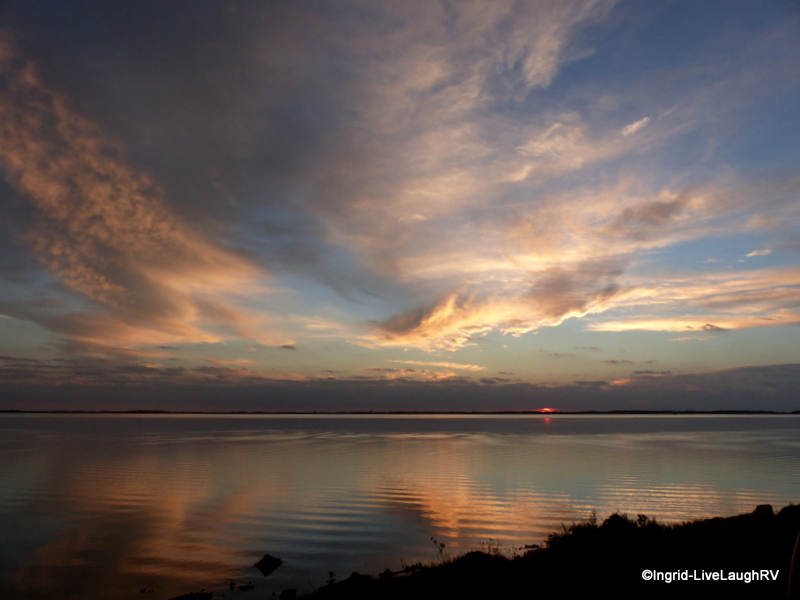 This was our third January camped near Rockport, Texas, and was our best visit yet. Perhaps the saying third times a charm is true, because this visit certainly was a charmer. Last year’s visit found us dealing with the Polar Vortex meaning lots of cold, wet weather. I also contracted pink eye aka conjunctivitis which put a real damper on my photography. This year with all the talk of El Nino along with the fall flooding in Texas, Al and I actually thought about canceling this trip to the coast, but since we already had the RV park reservation lined up, as well as friends waiting for us, we hit the road and arrived New Year’s Eve. And boy, am I ever glad we decided not to cancel. Al and his buddy had a fun month of taking the boat out into the St. Charles Bay every morning doing what guys do best; hunt, fish and BS. I had a fantastic time playing with my camera(s) but when new neighbors pulled in next door my fun was taken to another level. During a casual get to know the neighbor conversation, Mary Ann informed me she enjoys photography. Well, she didn’t have to tell me twice. Next thing she knew, I was getting her out of bed early, loading her in the truck, and sharing all my favorite (and not so favorite) photography spots with her. 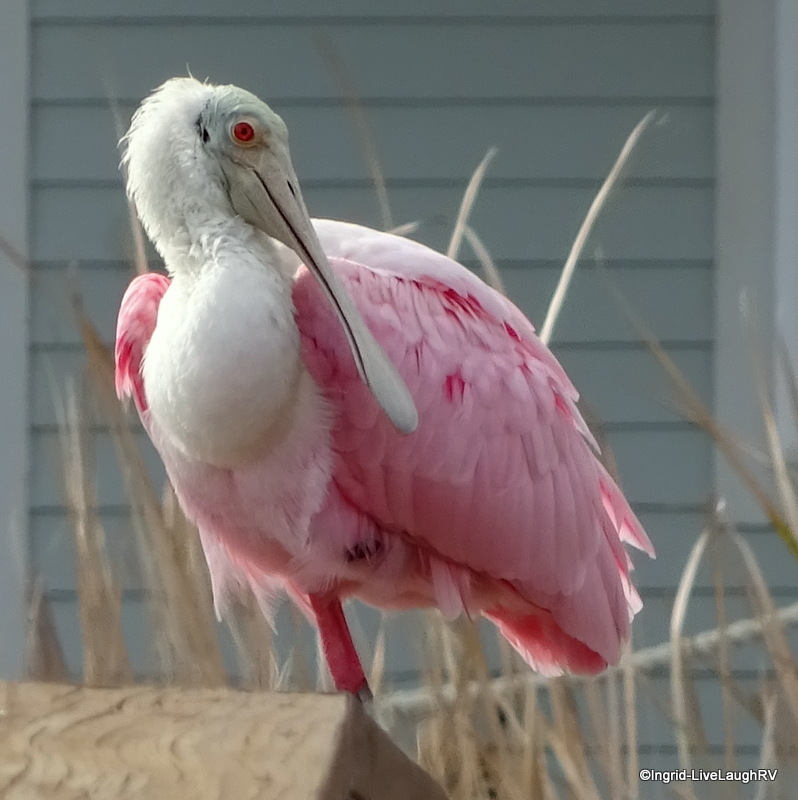 The vibrant pink of the rosette spoonbill is easy to spot. 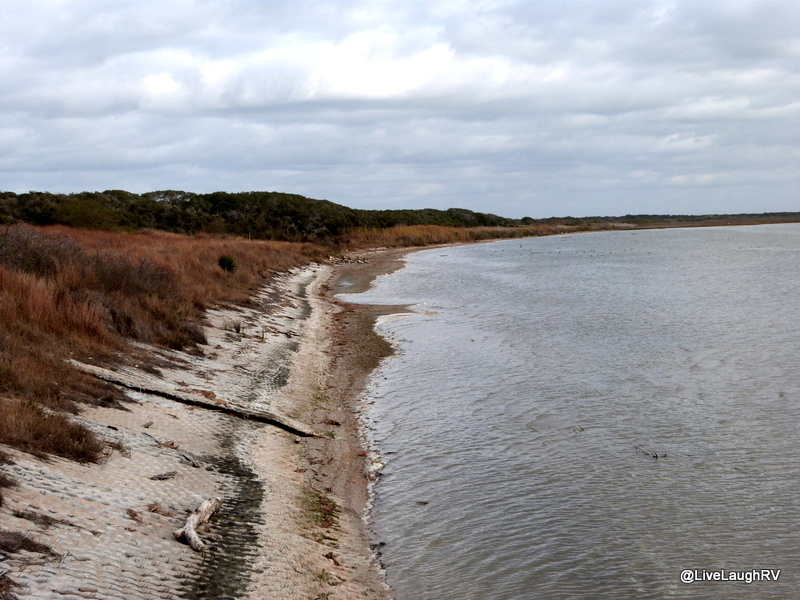 Our first full-day outing was up to the Aransas National Wildlife Refuge. I skipped a trip here last year because of my eye illness, and therefore, I was looking forward to a visit this go around. And just like my first visit, I was somewhat disappointed with the refuge. it took my digital zoom to spot that javelina or could that be a hog? 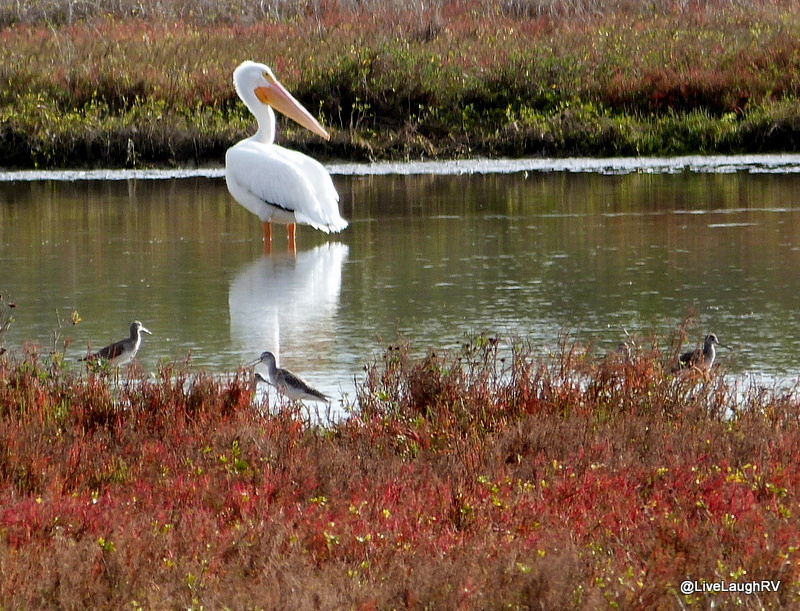 The showing of birds at the refuge was poor, and several trails / viewing overlooks were closed. 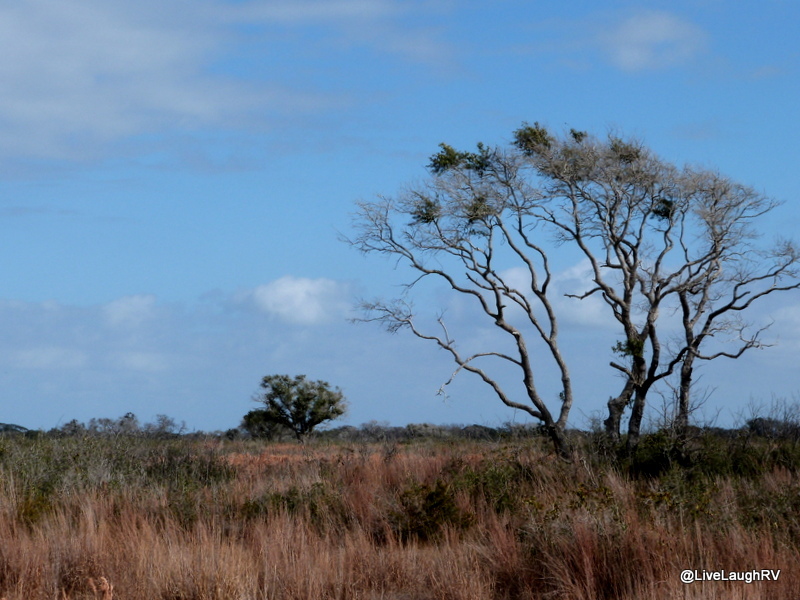 I don’t think I could honestly recommend going out-of-the-way to visit the Aransas NWR. If you’re in the area and interested in a picnic outing, then by all means, but if you’re looking for a well maintained, wildlife rich place, this isn’t it. Next…. I always enjoy a visit to Mustang Island and the town of Port Aransas. I cruised the island twice by myself and once with Mary Ann. Commutes via ferry never get old, and are a fond addition to a day of adventure. 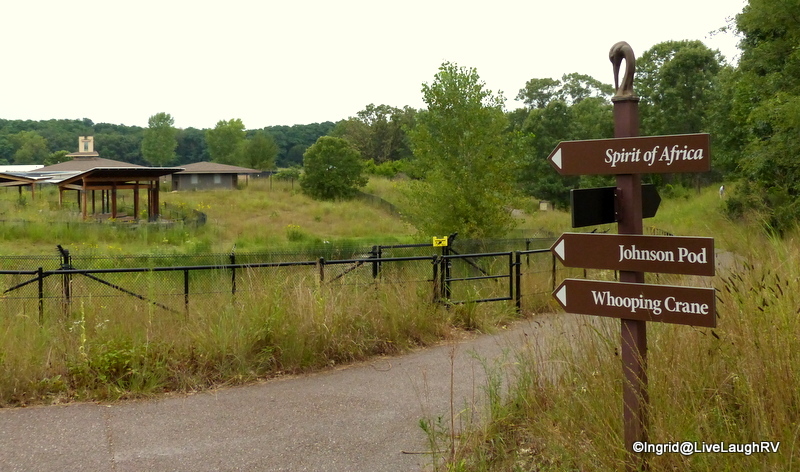 This is the boardwalk at the birding center. The woman is carrying a newborn baby. Look in the water to her right. Mr. Alligator is eyeing her. He was hungry that morning and on the move. In the town of Port A (aka Port Aransas) a stop at the Leonabella Turnbull Birding Center and stroll at Charlie’s Pasture is always worthwhile. Then there’s driving on the beach and sharing lunch with feathered friends. 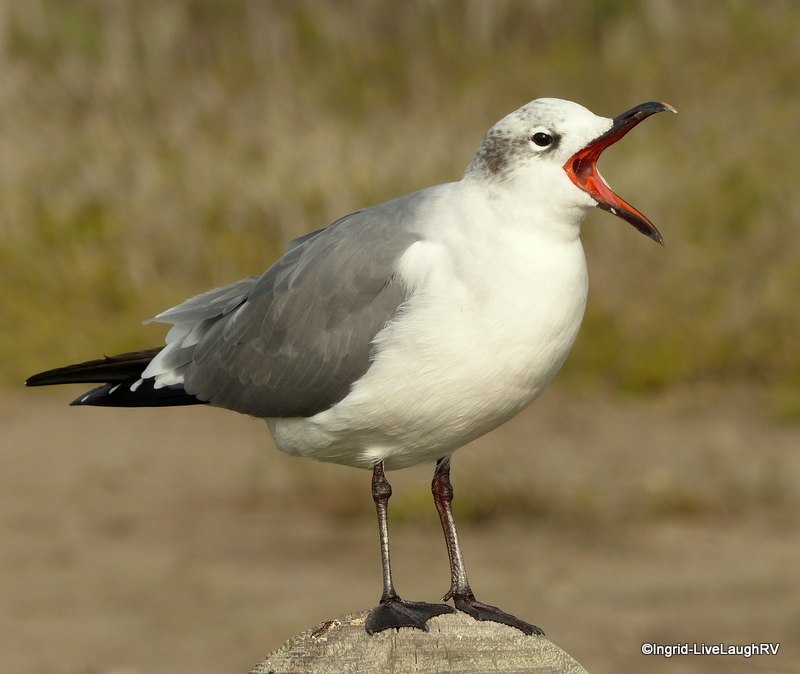 Seagulls can always be counted on for a little entertainment. It wasn’t long before I discovered my partner in crime (Mary Ann) was adept at spotting those vibrant pink beauties; the roseate spoonbill. I can never seem to take enough photos of these unique characters. But then I do love the vibrant white of the egret ….. How about a little vibrant pink and white together with a touch of striking yellow? Aren’t these two beautiful? The highlight of my visit to the Texas Gulf Coast was the morning Al’s friend, Dennis, took me out for a boat ride for the specific purpose of photography. I just can’t thank him enough for two hours of sheer perfection and joy. We launched the tiny vessel twenty minutes before sunrise. It was a cold 32 degree morning (one of the coldest all month) with no wind and clear skies. He thought for sure I was going to cancel due to the cold. Not a chance! I couldn’t wait to get out on the water. I wore my winter coat with one of Al’s camo coats over it along with earmuffs, camo hat, warm gloves, and sweatpants tucked into rubber rain boots. Sorry folks, no photo of this fashionista. I was super comfy and with no wind, it was a perfect morning. 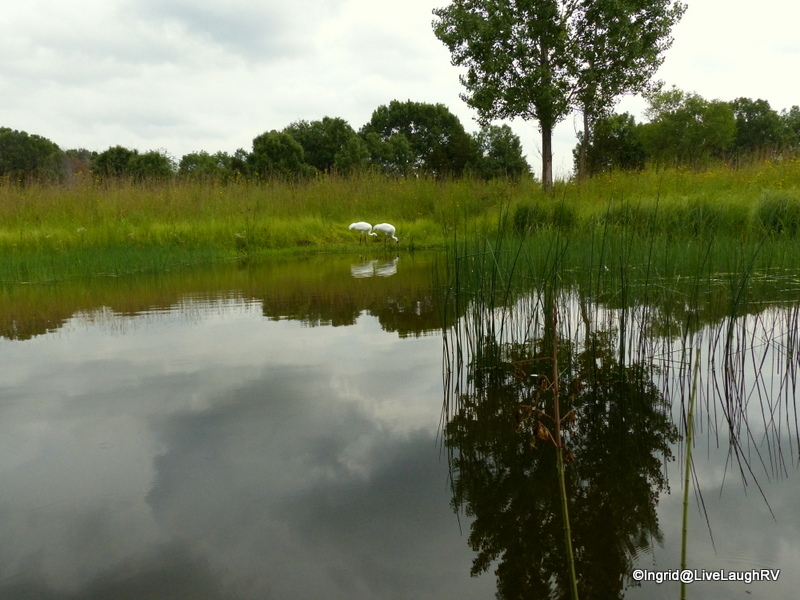 Can you spot the two whooping cranes? As we slowly cruised the waters, the sun rose. 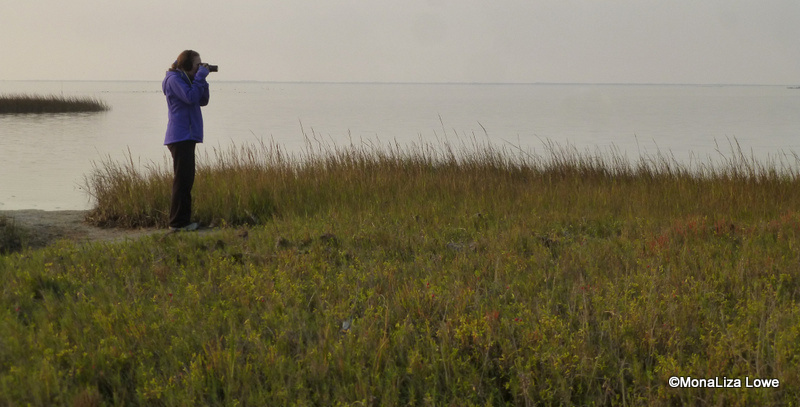 We kept an eye on the shoreline in search of wildlife, and from time to time, we could hear the familiar call of cranes. 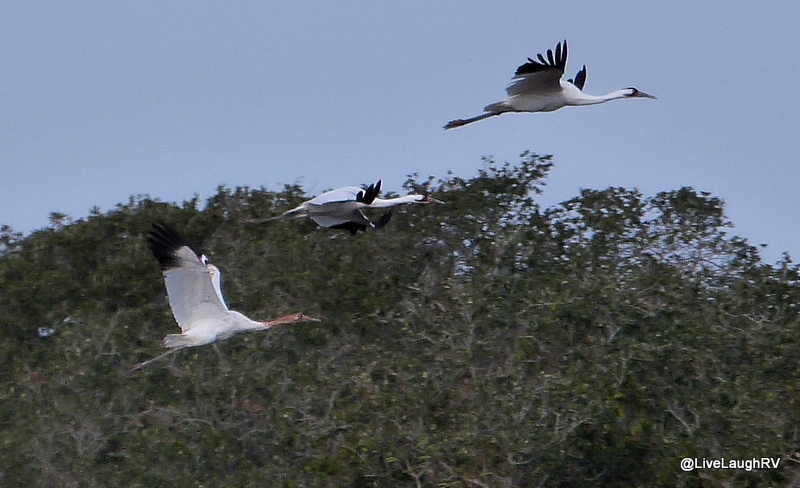 Once we spotted the cranes, the boat motor was turned off, and we floated toward shore. I carefully stepped on the front of the boat steadying myself and raised my camera up over my head as high as my five foot four frame would allow. This is one time I was grateful my Panasonic FZ200 had a flip out monitor. 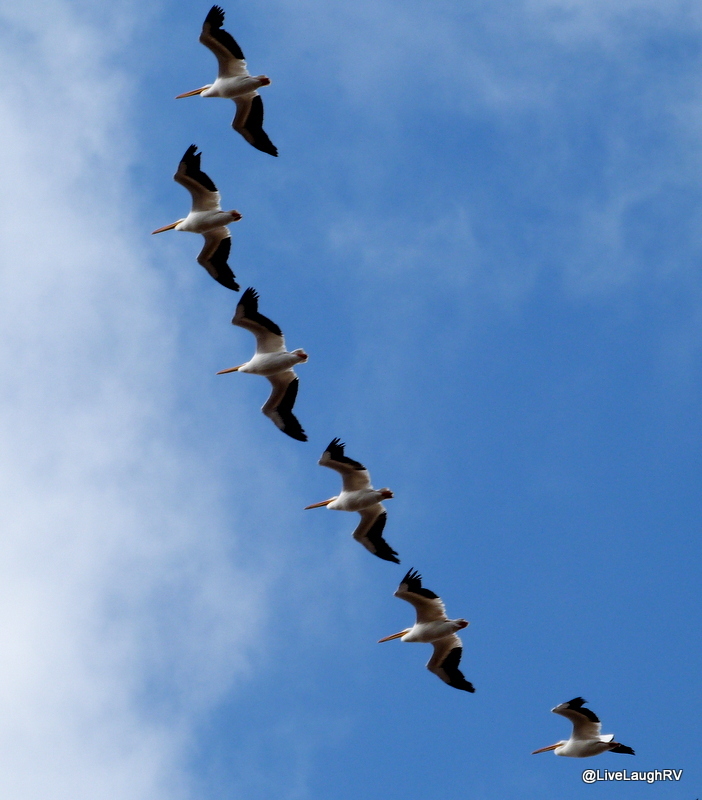 The front sandhills are getting ready to fly…. camera ready. 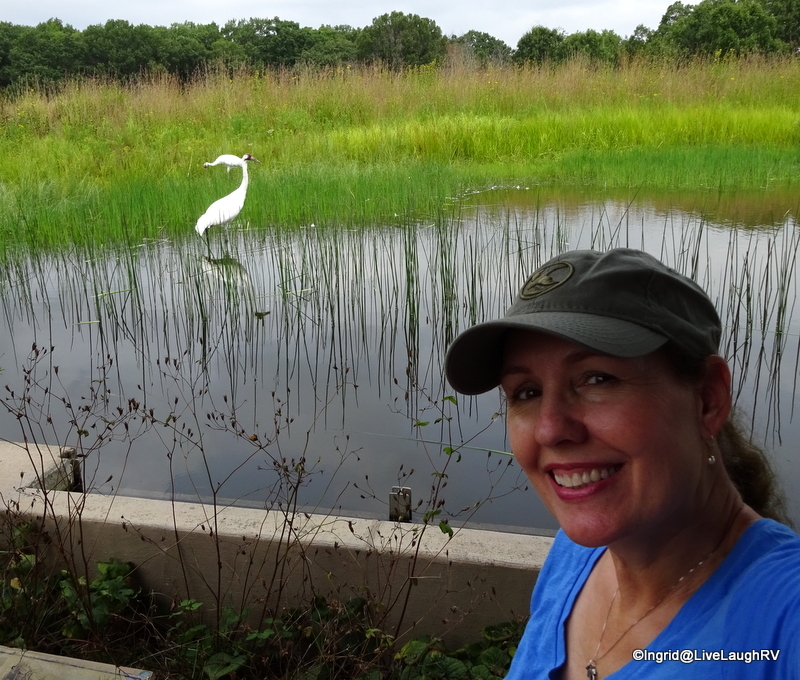 I was thrilled to see not only the endangered whooping cranes, but a smorgasbord of coastal birds; egrets, sandhill cranes, killdeer and those lovely pink roseate spoonbills. I was tickled pink with delight and this was by far the highlight of my visit to the Texas Gulf Coast. I would be remiss if I didn’t share the highlight of Dennis’ morning. While I was clicking away, he was drinking his thermos of hot coffee and enjoying the scenery around him and that’s when he spotted a dolphin. In a whispering tone, he informed me of the dolphin. When I turned around to look out over the water, there was a sudden flurry of activity as the dolphin was feeding. Dennis had never seen this before and was as giddy as a school child…. or as giddy as me seeing the wonderful variety birds. He and I both enjoyed our morning out on the water. My boat ride ended with a photo of this trio. Yes, this was one fun month filled with a bunch of wonderful surprises. Al and I are already looking forward to returning next January, and who knows, we may even extend our stay. The desert or the coast? I’m glad we can split our time between the two, because I don’t think I could pick. Let the tug of war commence! 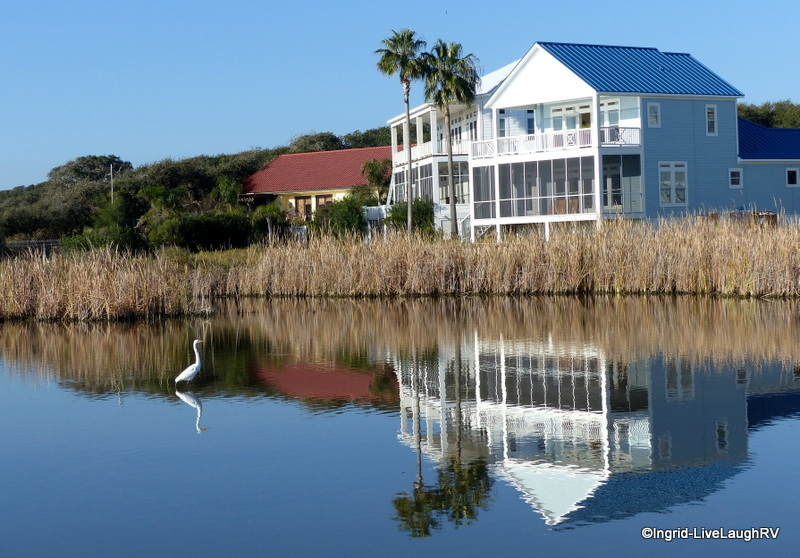 The past two winters, we’ve spent the month of January in Rockport, Texas. The impetus of the original trip (2 years ago) was initiated by one of Al’s buddies which focused on Sportsman activities…. you know; manly men, doing manly things. I didn’t mind, considering the majority of the time we’re traveling to places I want to go. I figured it would be the perfect opportunity for a little alone time and for me to focus on a project stewing in my head. 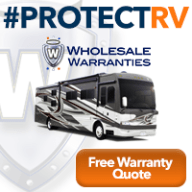 The RV Park was chosen by the buddy and my initial opinion on the place was less than favorable, but the beauty of living in a home on wheels is everything’s temporary. So while the guys were off doing their manly stuff, I started exploring the area. The RV Park was located in a rural residential area just down the road from Goose Island State Park. Several times a day, I’d either ride my bike or walk around the neighborhood. 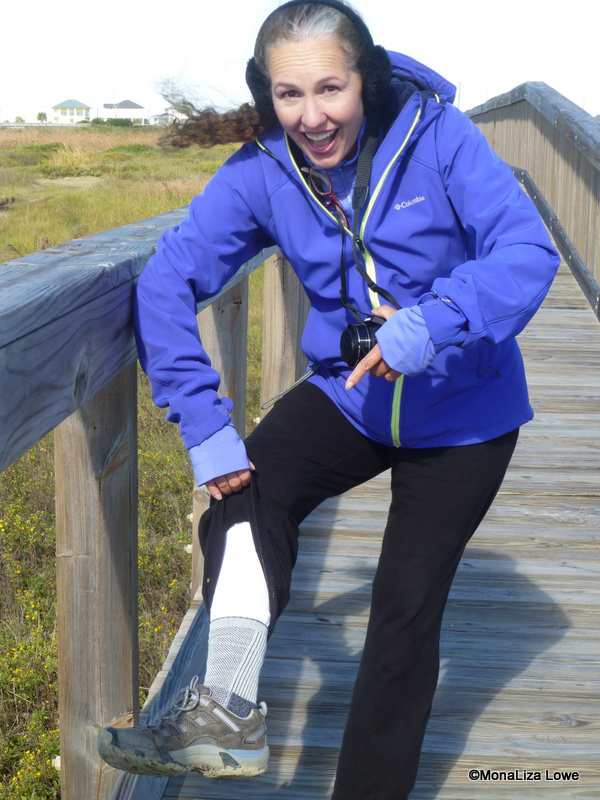 This is when I discovered a large white bird. The loud whooping call of the bird was hard to ignore and I became quite intrigued. 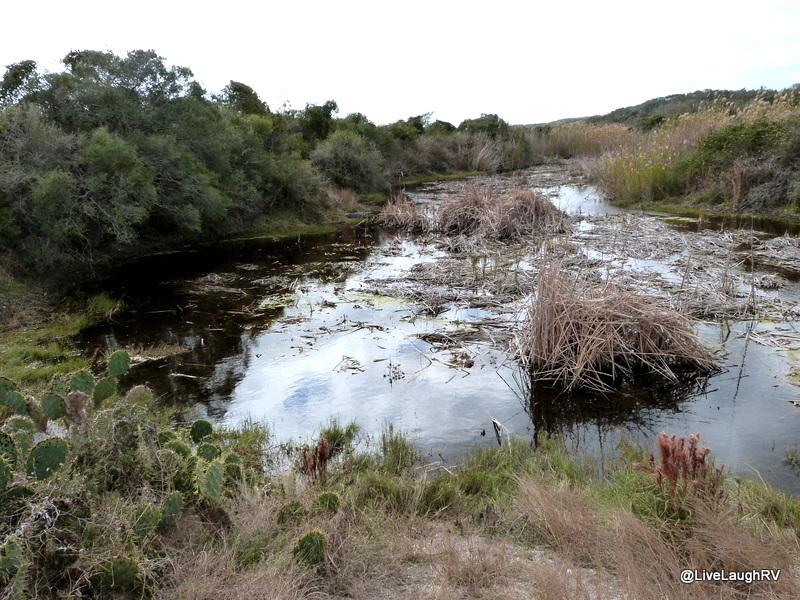 I snapped some photos and the following day I ventured out to the Aransas National Wildlife Refuge. I was off to an early start and may even have been one of the first few visitors to the refuge that morning. Before leaving the refuge, I stopped in at the visitor center. The volunteers were a delight. All fellow RVer’s workamping at the refuge. They were quick and enthusiastic to share information. Again the word whooper was mentioned. 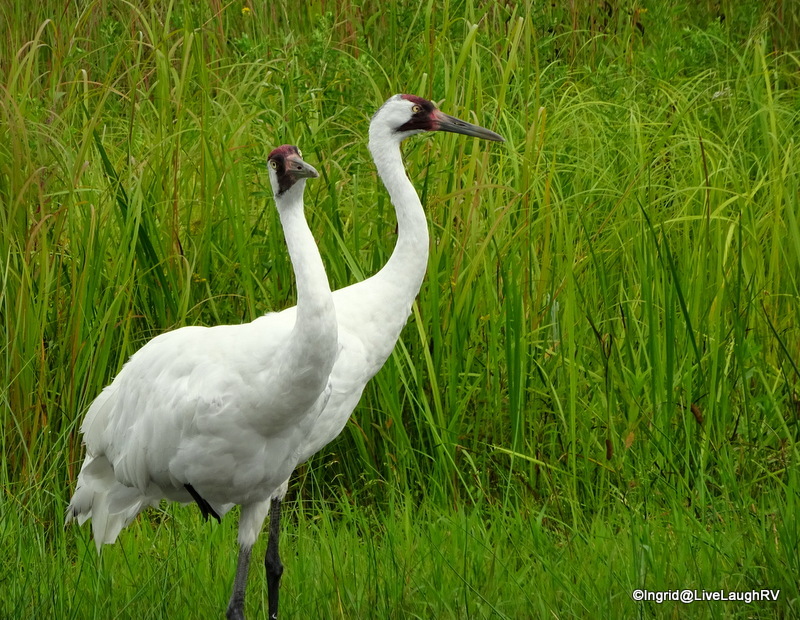 I finally asked, “I’m sorry, but what’s a whooper?” Ten minutes later, I’m more intrigued with these unique birds than ever before, and educated on the blight of the endangered whooping crane. 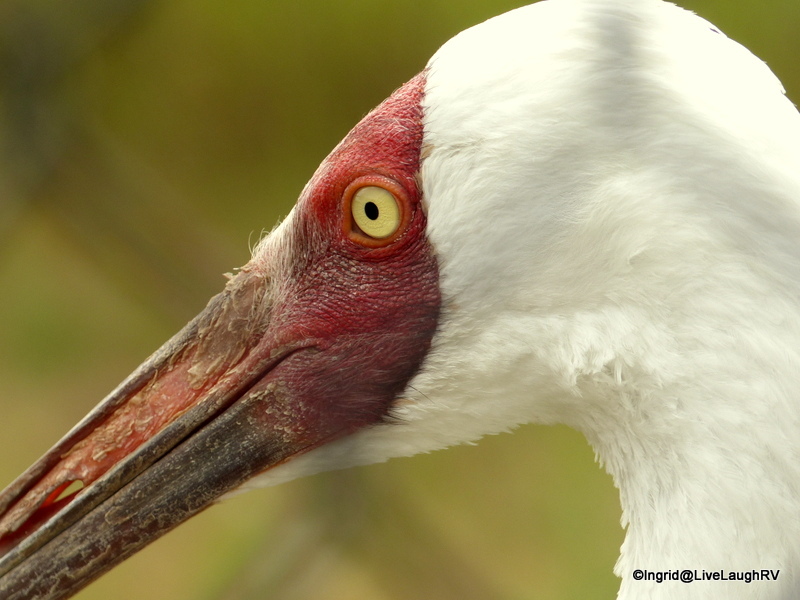 Come to find out, folks from around the country come to this area of Texas to see the last remaining WILD whooping cranes and here I was stumbling upon them without effort. 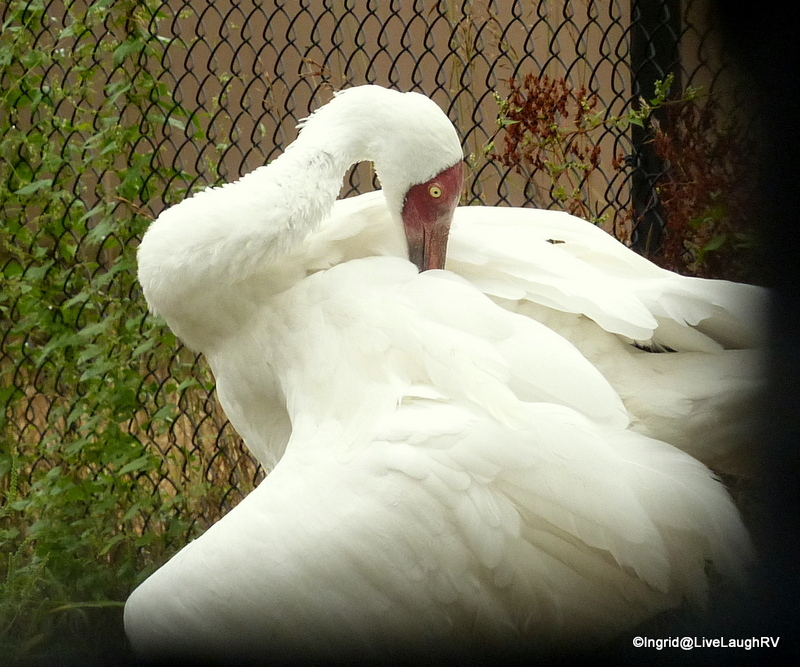 Siberian Crane – Russia and China. Most endangered breed. 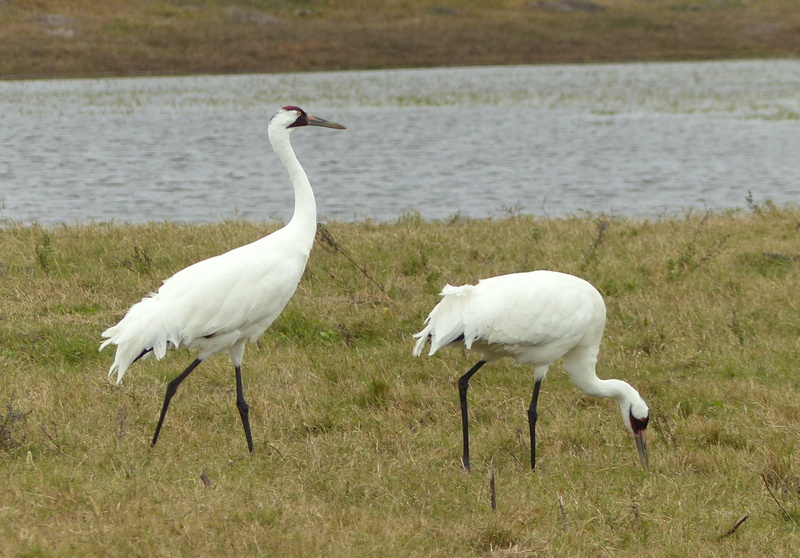 I spent the rest of the month observing the wild whooping cranes along with some sandhill cranes. 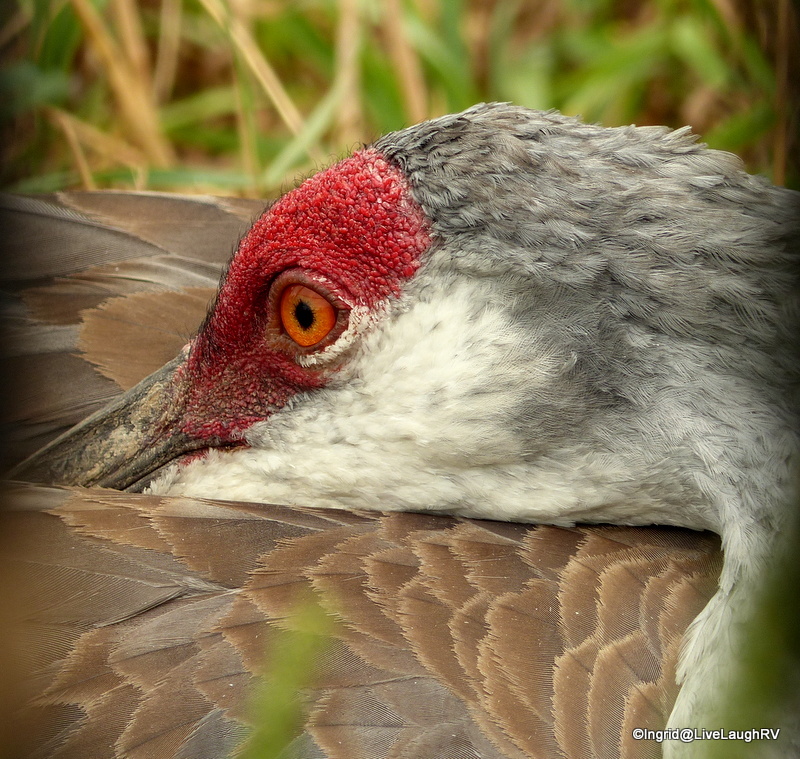 Oh, there were lots of other bird discoveries I enjoyed as well during that trip, but by passion lied with the cranes. I’ve never considered myself a birder, but there’s just something I’m drawn to when it comes to cranes. During one of my photography outings in Texas, I befriended a few fellow photographers and that’s when I first heard the word Craniac used. 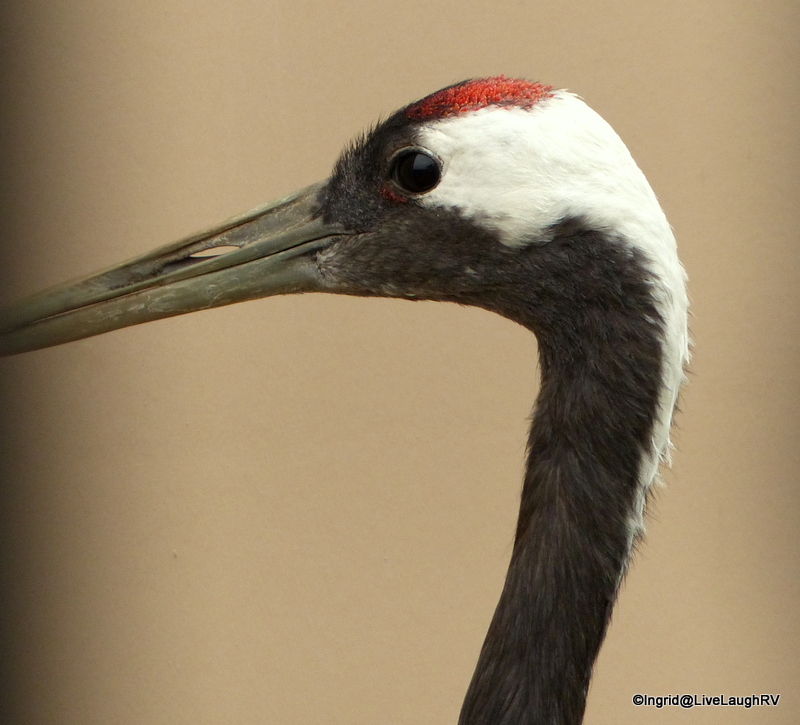 Craniac = fictitious name used to describe anyone with a passion for cranes. Seems I may have accidentally become a Craniac myself. 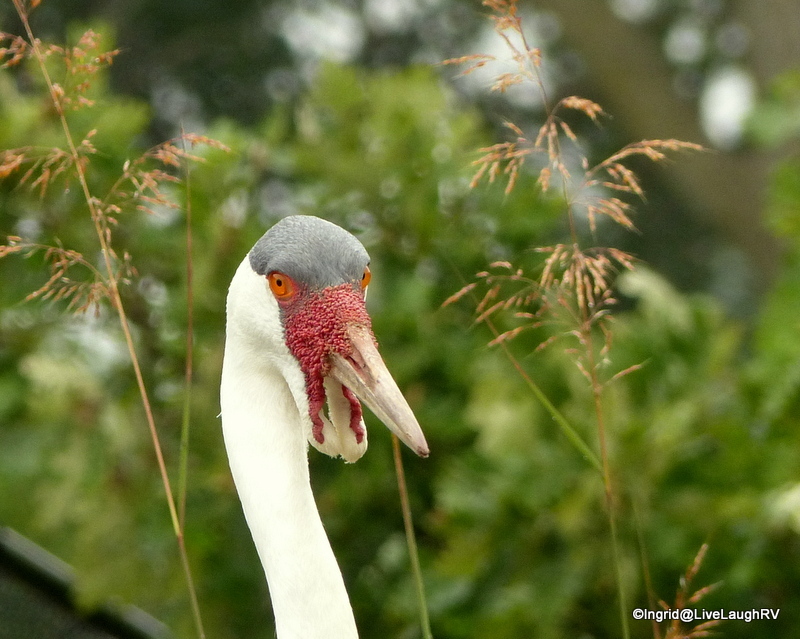 You can imagine my exuberance when I heard there was an International Crane Foundation. Once again my good friend, Mona Liza, was able to enlighten me, having already visited. 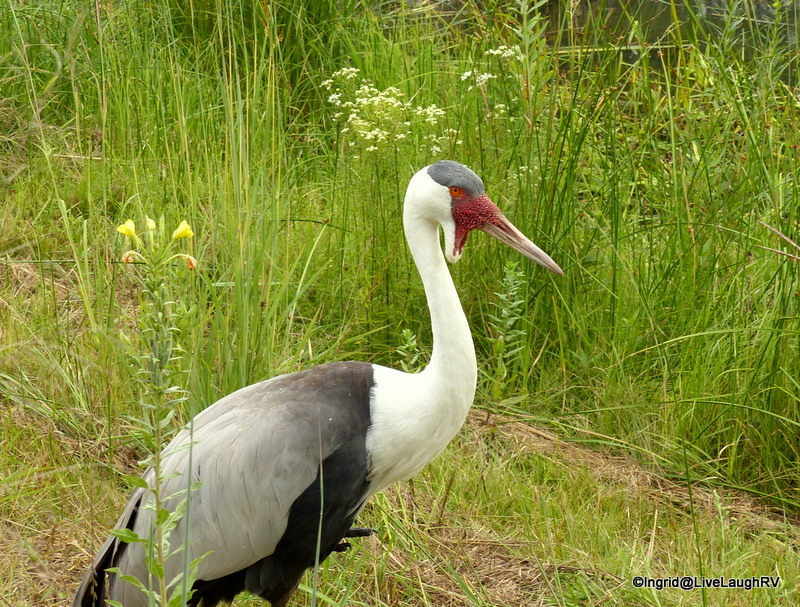 Hubby and I were formulating a summer family visit to the Midwest and thus a visit to the International Crane Foundation could easily fit into our plans. It became a MUST on MY itinerary. So here I am. 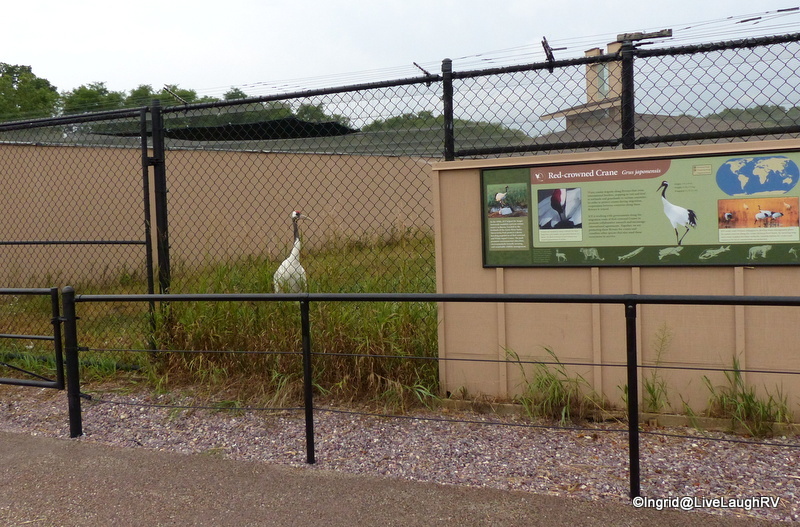 I arrived at the International Crane Foundation located in Baraboo, Wisconsin, shortly after 9:00 in the morning with plans to attend the 10:00 guided tour. Until it was time for the tour, I strolled around grounds. 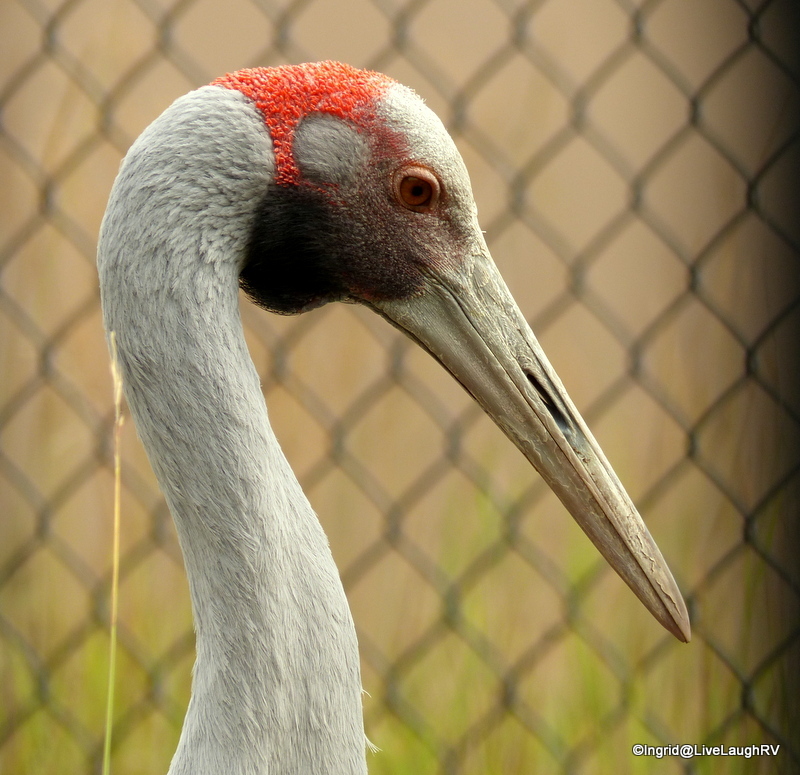 I’ll admit, I was initially disappointed and saddened to see most of the cranes behind fences. 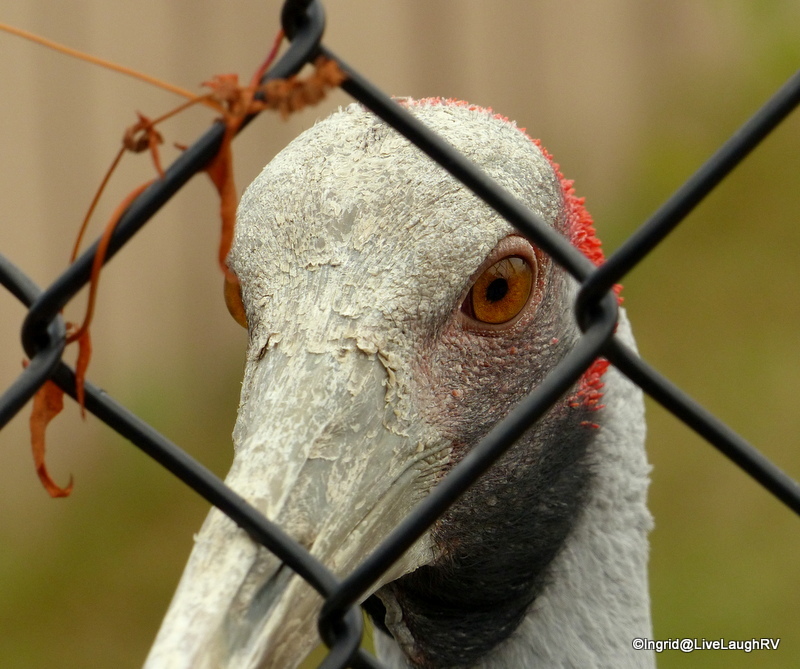 I later learned, the fencing is more about keeping predators OUT, plus it’s all about the greater good of the survival of all cranes . 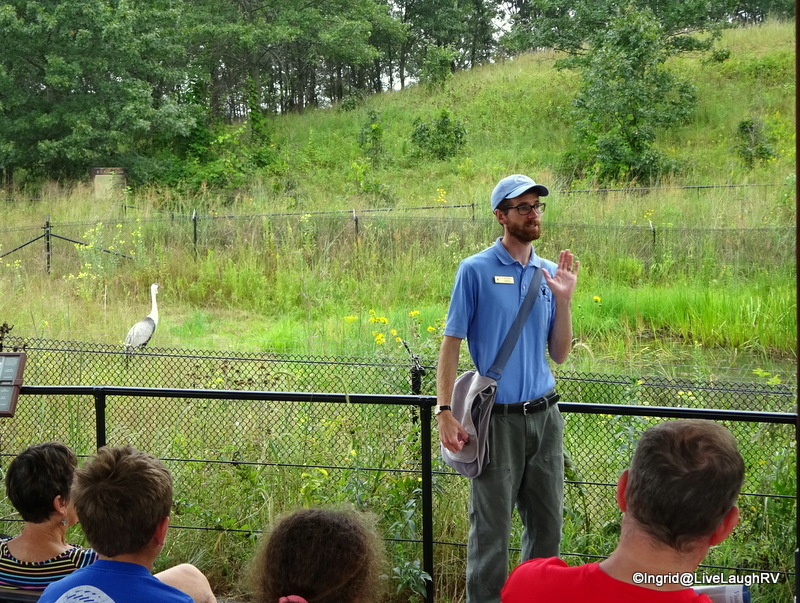 Our tour guide, Cully, was a wealth of information on the birds and the facility. He was extremely knowledgeable and able to answer any and all questions. After my almost 2 hour guided tour with Cully, I was enlightened and educated beyond my expectations. 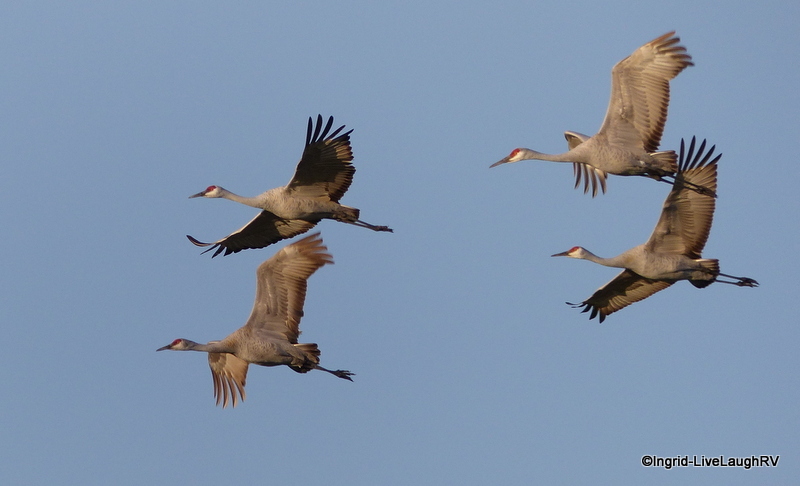 There’s even cooperative efforts with the North Koreans to protect habitat for cranes. It’s amazing what this foundation is doing around the world. 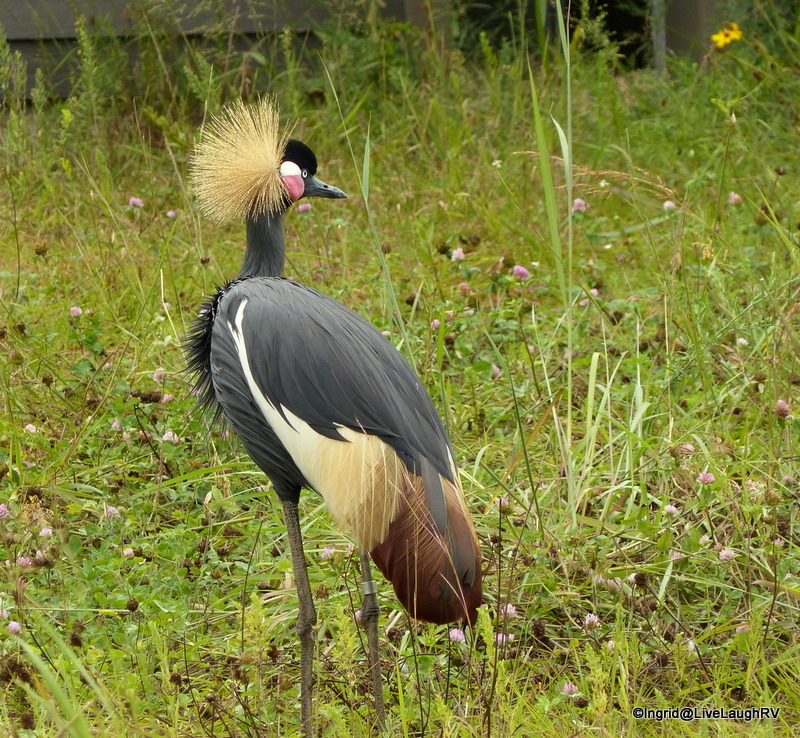 Not only is the effort to save cranes having a positive impact on their overall repopulation, the efforts are also improving the lives of people. It’s a win win for all involved. 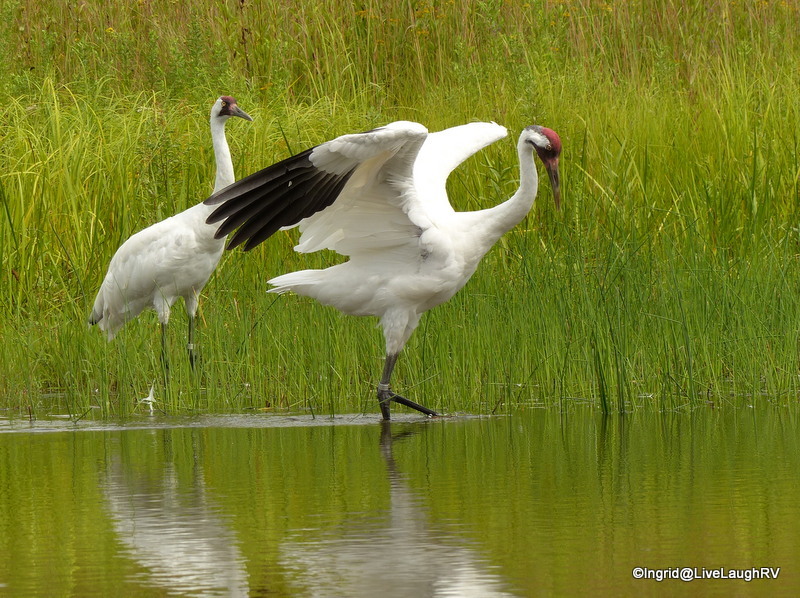 The International Crane Foundation in Baraboo, Wisconsin, is the only place in the world where all fifteen crane species can be seen. The respect and care for the birds is obvious. 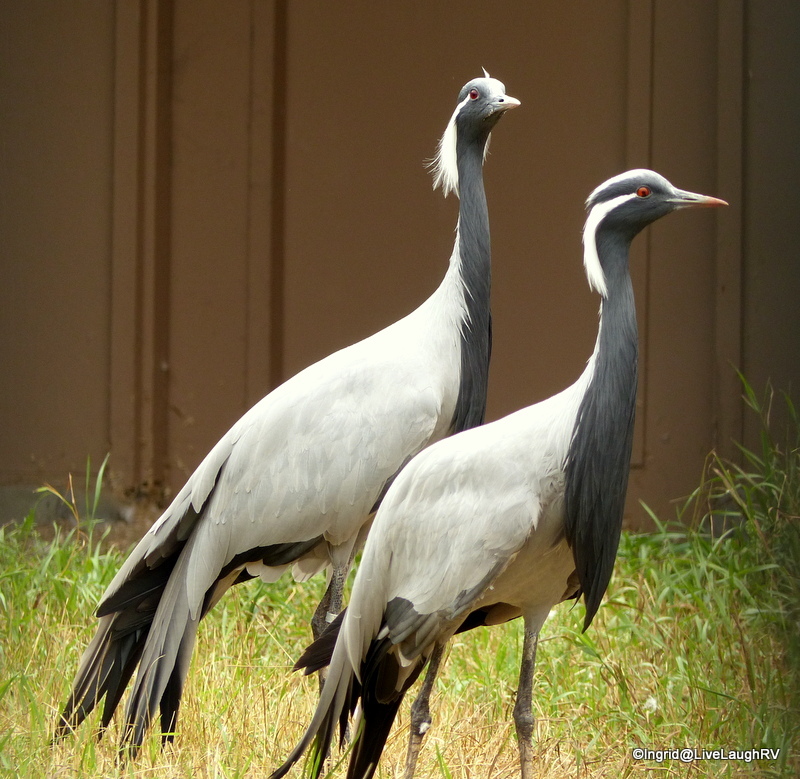 Breeding couples and new chicks are kept away from the public eye and any human contact is kept to a minimum in an effort to keep these cranes as wild as possible. I will say, photographing these beauties was a bit of a challenge. As I mentioned before, most are behind fences requiring me to find a strategic spot to zoom in between. Overall, I had a fantastic visit and would return in a heartbeat. 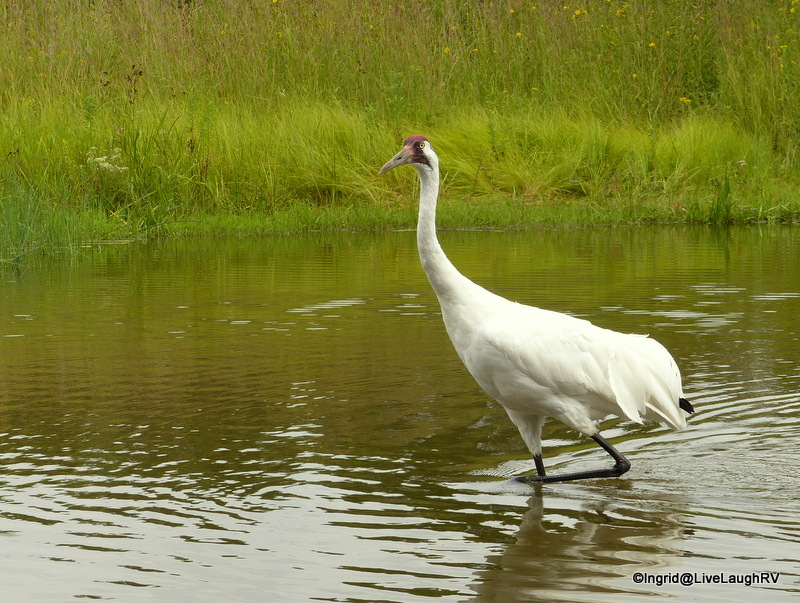 I ended up spending three hours there in the morning, had lunch back at the campground, and returned for another 2 hours of crane communing in the late afternoon. 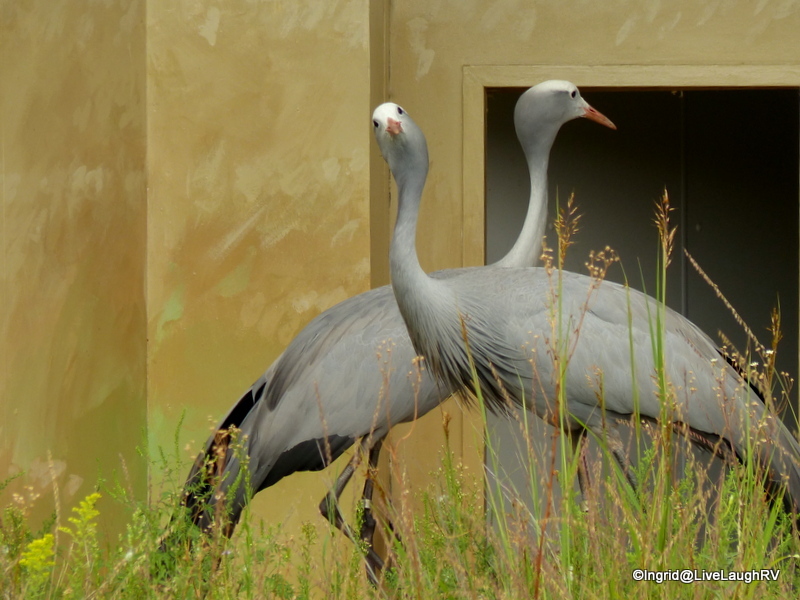 My crane obsession has been temporarily satisfied…. emphasis on the word temporary. 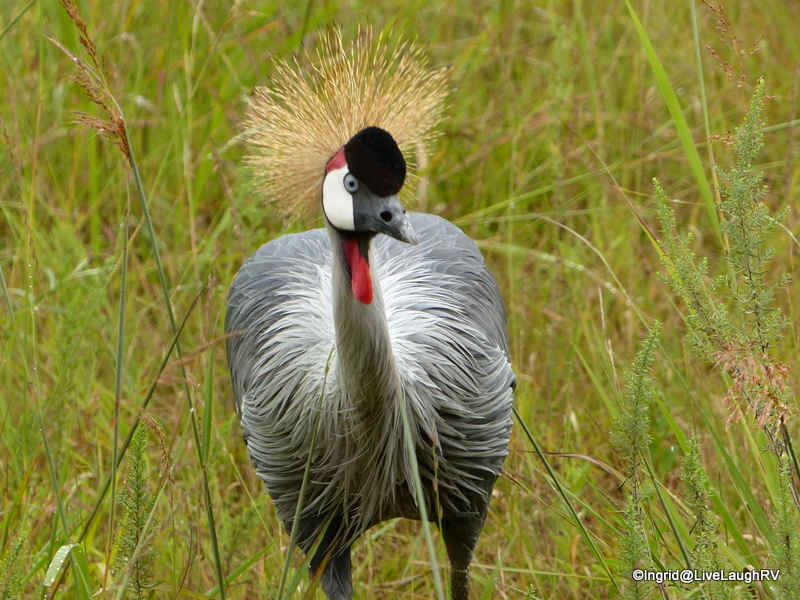 For anyone even slightly interested in ecosystems, conservation, or birds I would encourage you to visit the International Crane Foundation. 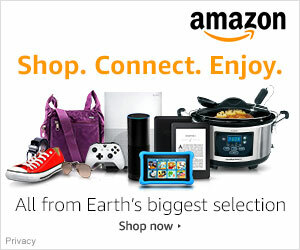 You can visit their website here…. saving more than cranes. 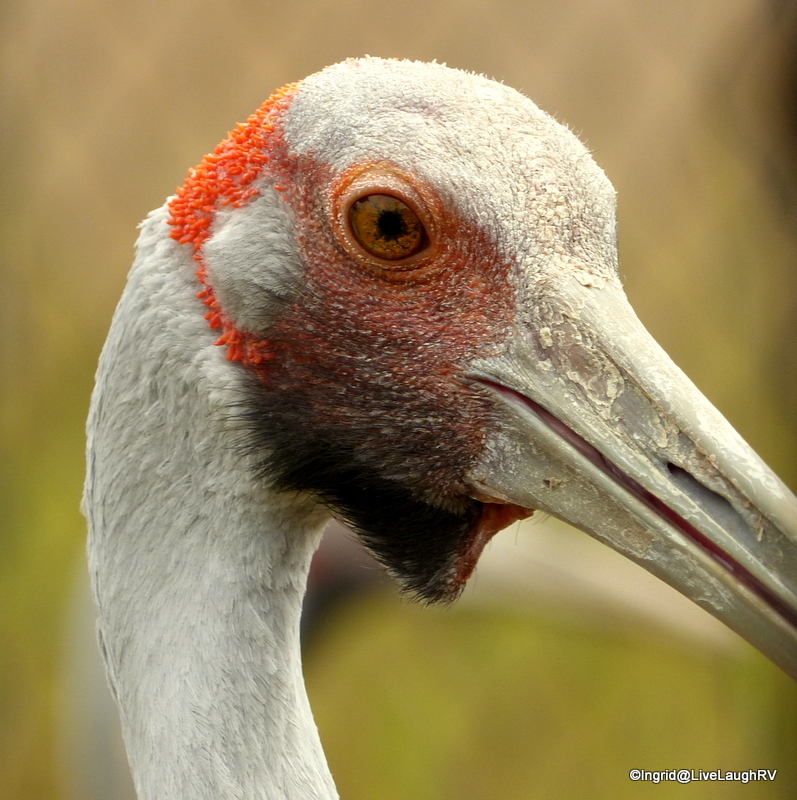 All photos were taken by me at the International Crane Foundation. I love photographing cranes from different angles, zoomed in, and zoomed out. I can watch these unique creatures for hours and quite often do when given the opportunity. This weeks WordPress Photo Challenge is; from every angle. I hope I’ve captured the essence of the photo challenge. Does this look like a happy camper? As I stand on the 40 foot high observation platform at the Aransas National Wildlife Refuge, I’m mesmerized by the vultures. I savor the quiet solitude as I stand against the rail. 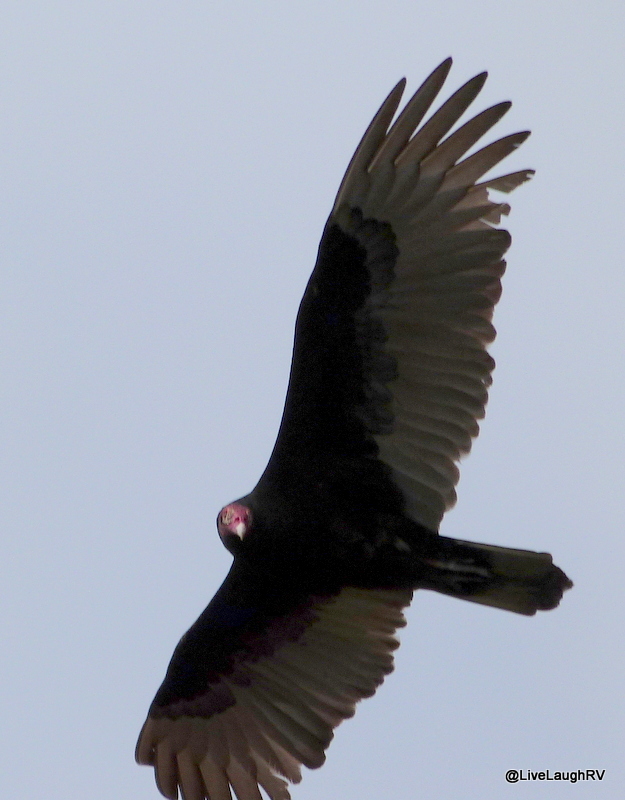 I watch the vultures gracefully soar through the air while hunting for prey. 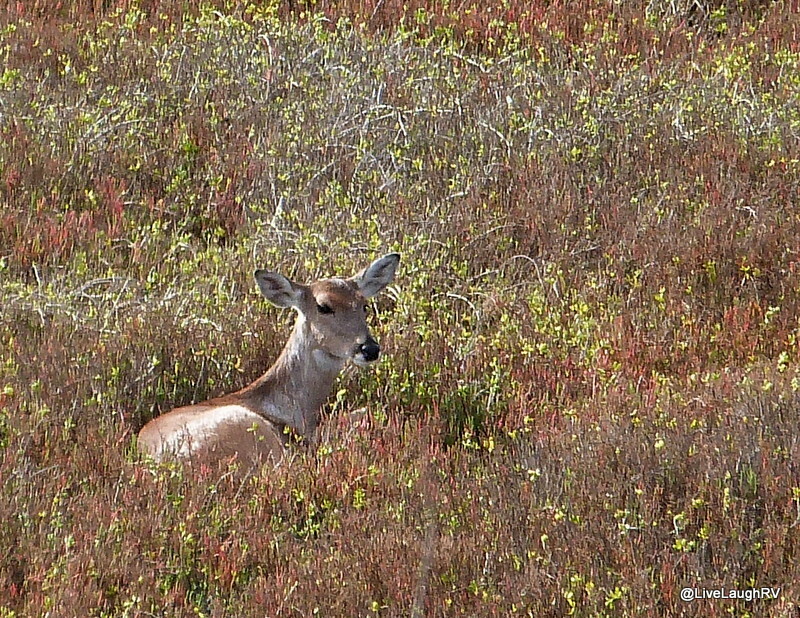 There’s a deer in the meadow below. I see flocks of birds in the distance. With eyes closed, I tilt my head to the sky breathing in the scent of the sea air while basking in the warmth of the sun. I’m totally lost in the moment. I’m in my own little word….that is until I’m abruptly snapped out of my trance by the shrieking tantrums of a three year old. So much for my fifteen minutes of solitude. Forty feet below me is the minivan whose occupants are clearly not happy. 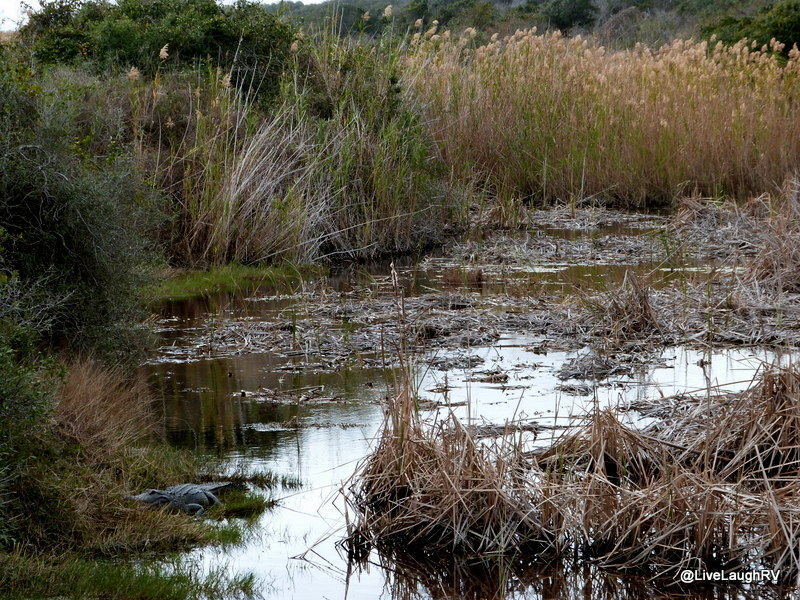 The disgruntled family can be heard across the marsh. The deer move on. Birds fly off including my vulture friends. As I hear the wheels of a stroller clickety clacking over the slated decking with a crying occupant making it’s way up the platform ramp, I take that as my que to move on as well. I scurry down the ramp passing the frazzled family. We exchange smiles and “good mornings”. I’m sure I was sporting a look of sympathy, although I’m not sure who I should feel sympathetic for; the kiddies who would prefer to see the likes of a Mickey or Minnie or the folks trying to expose the kiddies to some of natures beauty. Ah, I remember those days fondly. With the truck started, the intent is to make my way back via the same road…..nope, changed my mind and I take the 16 mile Auto Tour Loop inland. This single lane, one way, paved road provides a leisurely ride through the ‘Texas savannah’. Along the way one might see deer, hawks, javelina, bobcat, or the occasional snake crossing the road. There are pull-outs every now and then, but since I’m the only one out here, I feel free to stop occasionally in the middle of the road. I jump out of the vehicle from time to time to photograph the landscape. Yep, just the landscape as this gal did not encounter any other wildlife – well except for the wasp wanting to free load a ride. Yeah, not the brightest thing I did that day leaving my car window open in front of this sign. Loop completed, I stop once again at the ‘Heron Flats’ viewing area. Earlier in the day I had this place to myself. Now there are two other cars and a couple of cyclists. 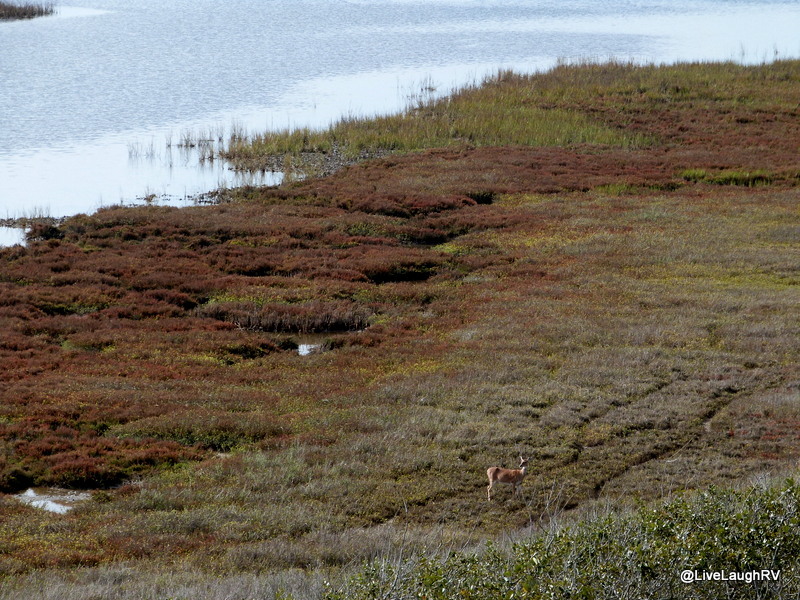 I look off to the right in the first marsh….nothing. I continue to the viewing platform…..very few birds. On my return to the truck a woman asks me if I’ve seen the whoopers. I respond, “I don’t think so. What do they look like again?”……Light bulb! “Oh, they were here earlier this morning”. Now I know. 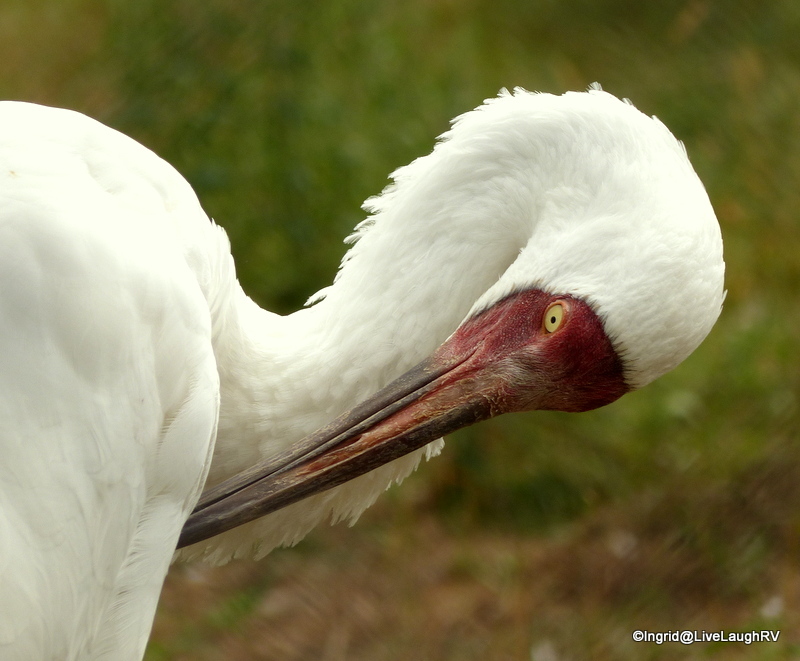 I’ve seen and photographed the endangered whooping crane without effort while folks from around the country are traveling to this area in hopes of their own personal glimpse. 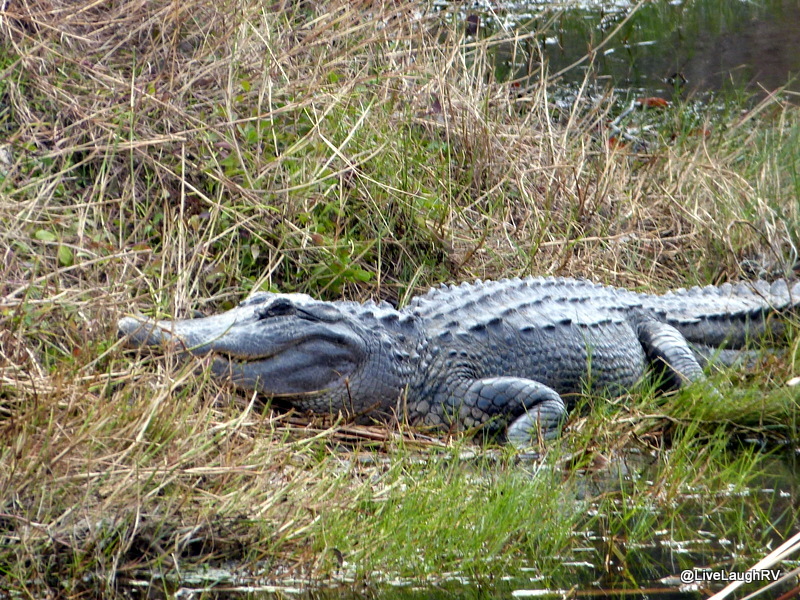 While having a pleasant conversation with this woman, her husband who had remained by the marsh near the beginning of the trail yells out to his wife, “alligator”. She and I swiftly join him at his side as he points out the rather large gator in the distance. There are no fences or barriers. The alligator looks well fed and ready for a nap. I did not notice him earlier and am grateful the gator was pointed out to me. Happy with my wildlife sightings this morning, I decide it’s time to return home. We won’t mention the growling stomach. Next time I’ll bring snacks. 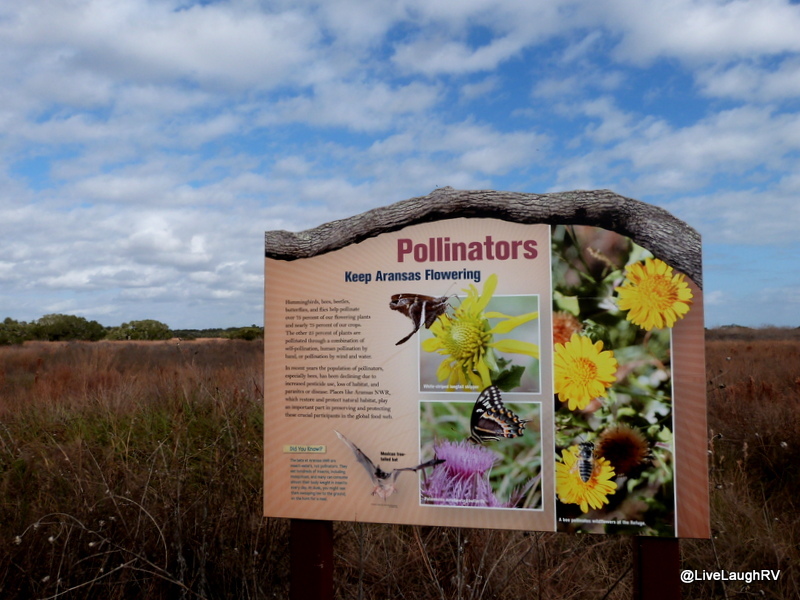 Would I recommend a visit to the Aransas National Wildlife Refuge? I guess it depends on ones expectations. I talked to some local wildlife photographers near my RV Park and they personally have never had much luck with their bird photo captures from land at the refuge. I hear, via boat is the best way. The refuge is located 35 miles north of Rockport, Texas, out in the boonies. I made the mistake of not packing a lunch. I think it’s a great place to learn and experience. However, I was disappointed several trails and viewing platforms were closed due to damage. I enjoyed the day and would go back, but I would go early in the morning and prepare to spend the day. That said, I have had better luck photographing birds off Fulton Beach Road and Lamar Beach Road……near Goose Island State Park, Texas.